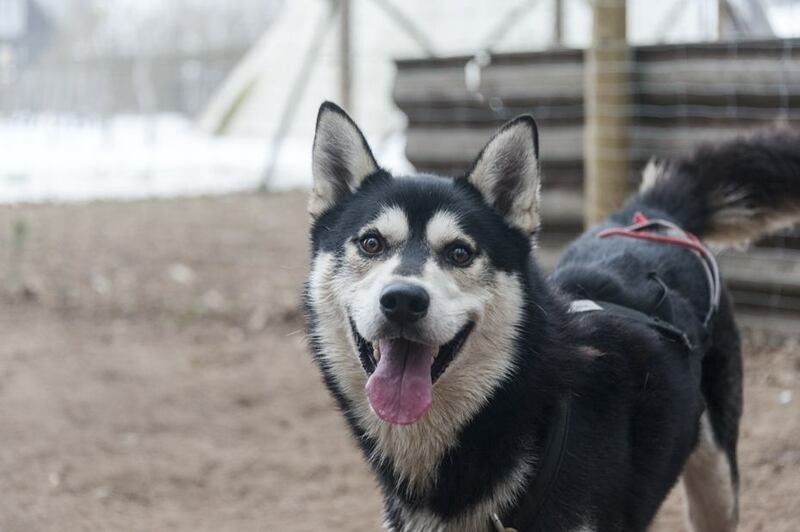 Dog Sledding in Lithuania – a dream comes true! As animal lovers, many of our ‘bucket list items’ before we started travelling involved activities with animals. Riding an elephant in India. Swimming with dolphins. Riding a donkey around Cappadocia. Yes, even visiting the Tiger Temple in Thailand – once upon a time, we thought it would be a brilliant idea. Then we started travelling, and the harsh reality of animal cruelty around the world hit us in the face, sometimes leaving us in tears. Elephant shackled to tiny little chains, donkeys and horses with wounds to their sides, after pulling tourist carts around for the whole day. Not to mention the scandals surrounding swimming with dolphins and the infamous Tiger Temple, that I would NEVER visit now, not even if I was paid a million dollars. For a while, we thought that the best way to avoid contributing to animal abuse was to stay away from all tourist-related activities involving animals. However, this isn’t necessarily the answer. The answer is research. Do your homework, and you’ll find that there are many humane ways for tourists to interact with animals, including volunteering opportunities all over the world. We loved spending time with these amazing dogs! And there’s more. Sometimes, we may be led to believe that ALL activities involving animals are essentially cruel and against nature. This isn’t the case. Working is in the nature of some animals, for example husky dogs. 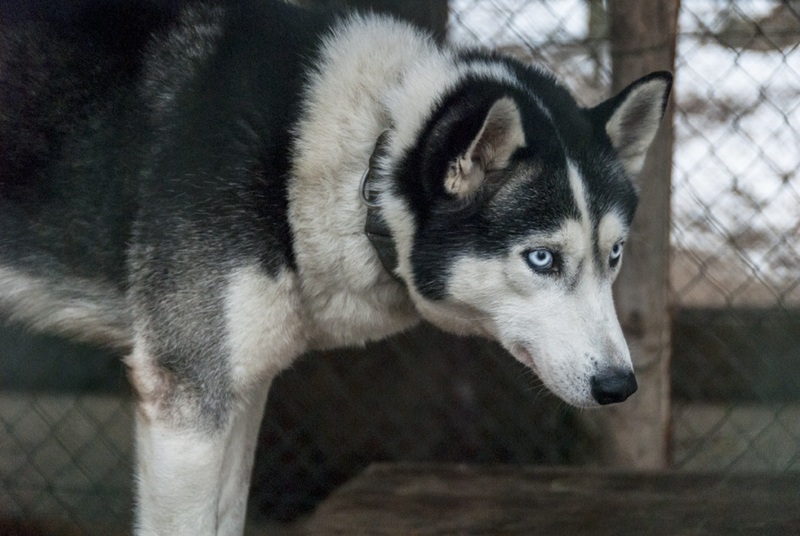 Huskies were bred to live and work in harsh Arctic climates – having them pull sledges in -20°C or colder is not cruel, it is what they are meant to do. 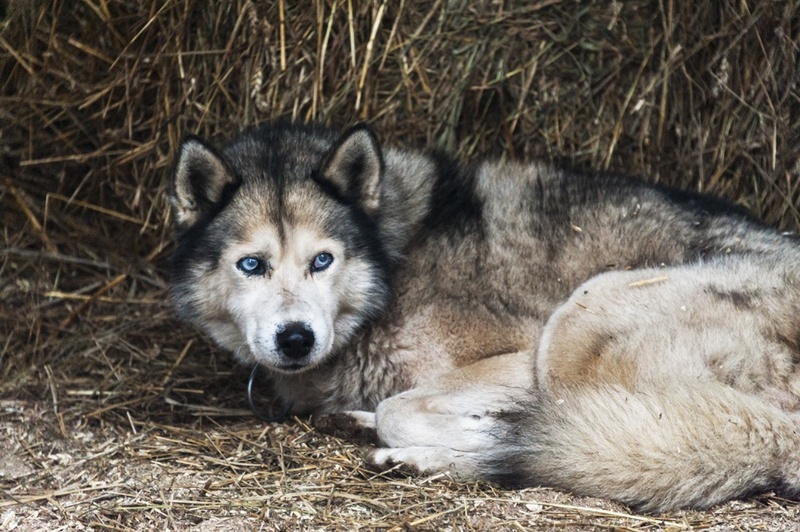 Provided they’re well treated – I’m not stating that you can just go out and choose any dog sledding operator at random, you still need to do your research. Dog sledding has been a dream of ours for a very long time. We both love huskies, and both dreamed of a husky puppy as children. The idea of zipping across the frozen countryside on a dog sled was for us a romantic dream, much more romantic than lying on a beach at sunset! 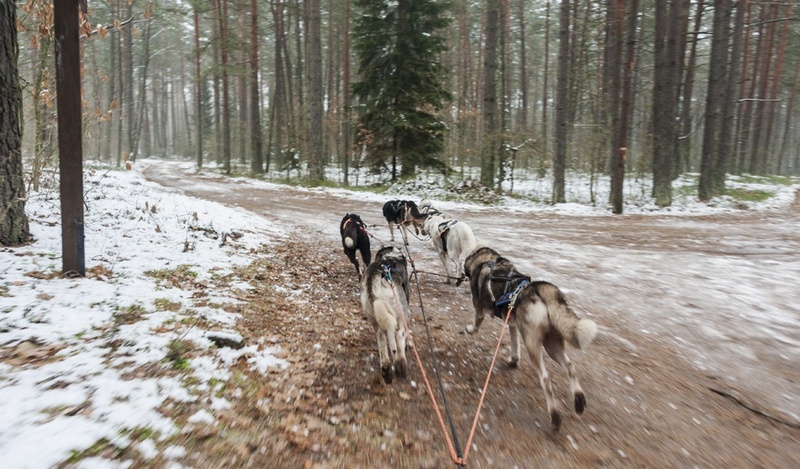 For years, we thought our dog sledding dream would remain that forever – a dream. Trouble is, it’s an expensive activity. It usually involves travelling to far-flung places such as Lapland or the Canadian Arctic, and the experience itself comes with a hefty price-tag. 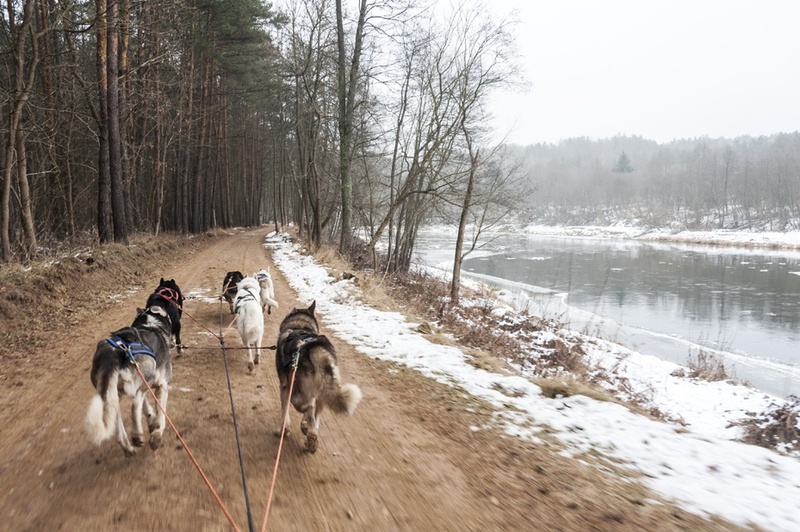 In December we spent a long weekend in Lithuania, and while researching the trip, we were thrilled to discover that it was possible to go dog sledding just outside the capital. 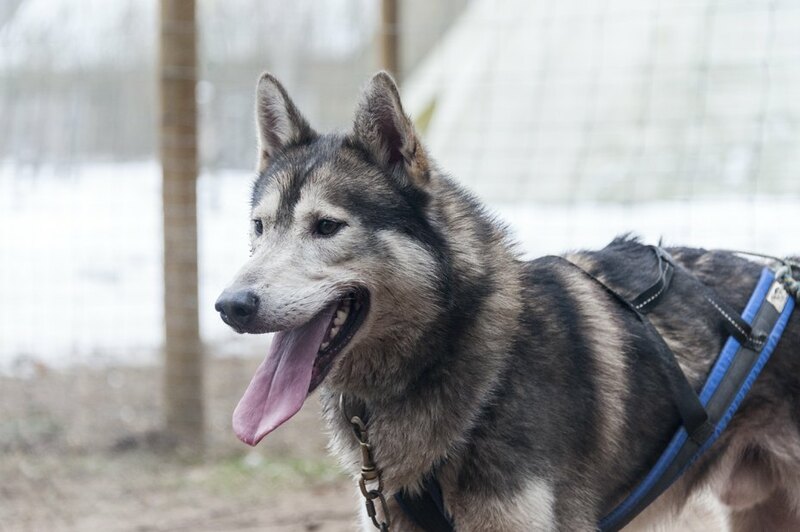 Nuotykių akademija (the name means ‘Academy of Adventure’) offers dog sledding experiences from €35 per person (based on two sharing) in their forest camp not far from Vilnius. 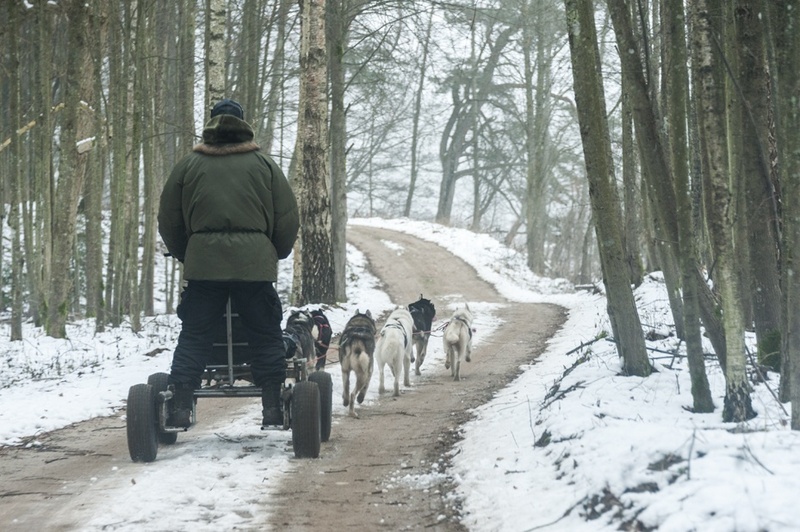 Easily accessible dog sledding, at a fraction of any price I’d ever been quoted before – we were sold. Not before researching the operator though. We read up on Nuotykių akademija and contacted the owners, as well as the Vilnius Tourism Board, who assured us that the dogs are well treated. Owners Jolanta and Hubert are crazy dog lovers, who built their forest camp to give a home to their dogs. 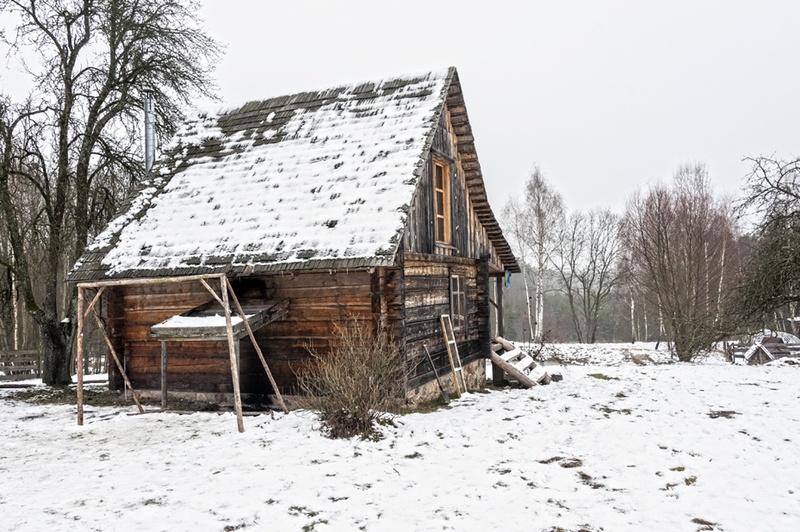 After a couple of days spent visiting historic and alternative Vilnius, we boarded a train towards Lazdėnai, a tiny hamlet in the frozen countryside about 40 km away from the capital. We were picked up at the station by Linas, one of Nuotykių akademija’s staff members, a university student and another crazy dog lover. We started our day with a tour of the Neris Regional Park, the forest surrounding the Nuotykių akademija homestead. 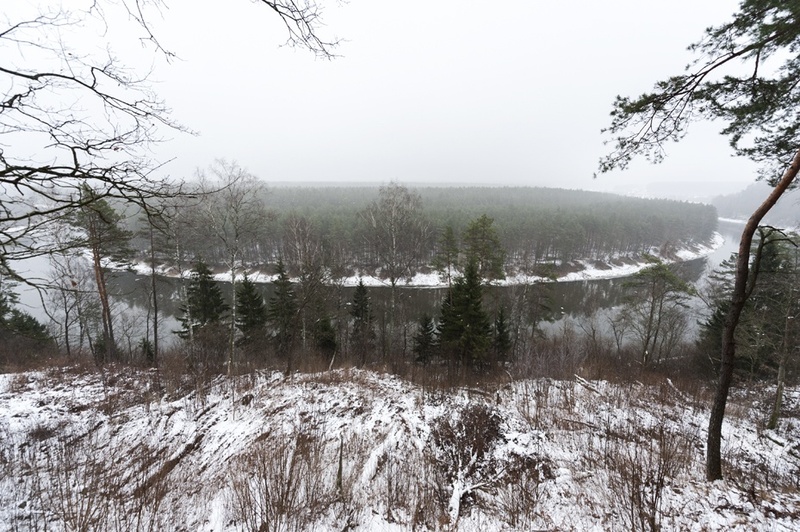 We walked to a forest spring, and to a wonderful viewpoint over the Neris River, but the day was grey and blustery, not the best to take scenic walks and admire the landscape. It did look wonderful, though – I can only imagine how beautiful walking around the forested paths in summer would be, stopping for a picnic on the banks of the Neris River or one of its tributaries. Shortly afterwards, we arrived at Nuotykių akademija. The homestead is set in a forest clearing. It’s a beautiful collection of wooden buildings and tepees, built by an employee who had a passion for Native American culture. Hubert and Jolanta were former city dwellers, able to turn their passion for dog sledding into a new lifestyle. 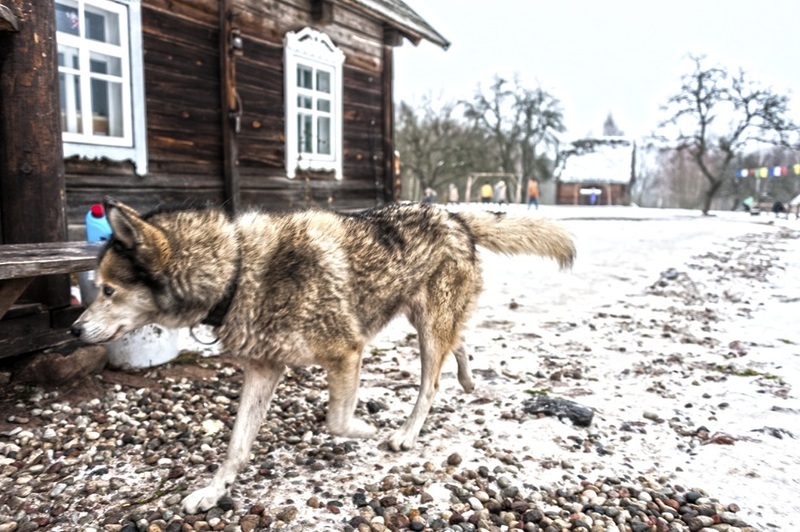 For years they participated in and organized dog sled races across Lithuania and the Baltic, and since 2006 they have welcomed tourists to their home, and offered activities with dogs, from dog sledding trips, to dog handling courses for children and pet therapy. 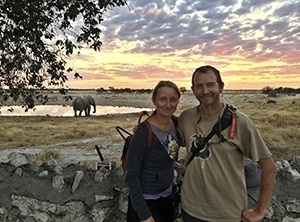 Hubert and Jolanta’s priority are their dogs, not tourists, and not their own entertainment. They love and take care of their dogs like family – anyone who has ever had or loved a pet will know the feeling, but these folks go a step forward, and put their dogs at the centre of everything. They moved to the forest to live in nature with their pets, participate in races to train the dogs physically and develop their personality, and started tourists programmes because they noticed that both people (especially children) and dogs love the interaction. If this is not love and respect for animals, I don’t know what is. As soon as we arrived, we went to see the dogs. They were housed in large and comfortable kennels on the grounds, and barked happily as we got close. Hubert told us that dogs know that as soon as he approaches, it’s time to work. And they LOVE to work. There was excitement in their barks, as if to say ‘pick me, pick me’! 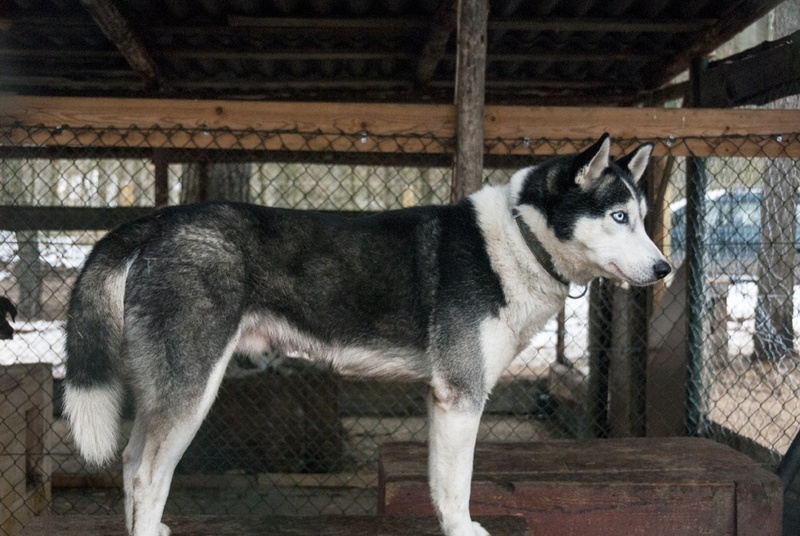 I was surprised to see that not all dogs were huskies or malamutes – half of them were ‘race dogs’, specially bred for dog racing, a cross of husky, German shorthair pointer and English pointer, among others. 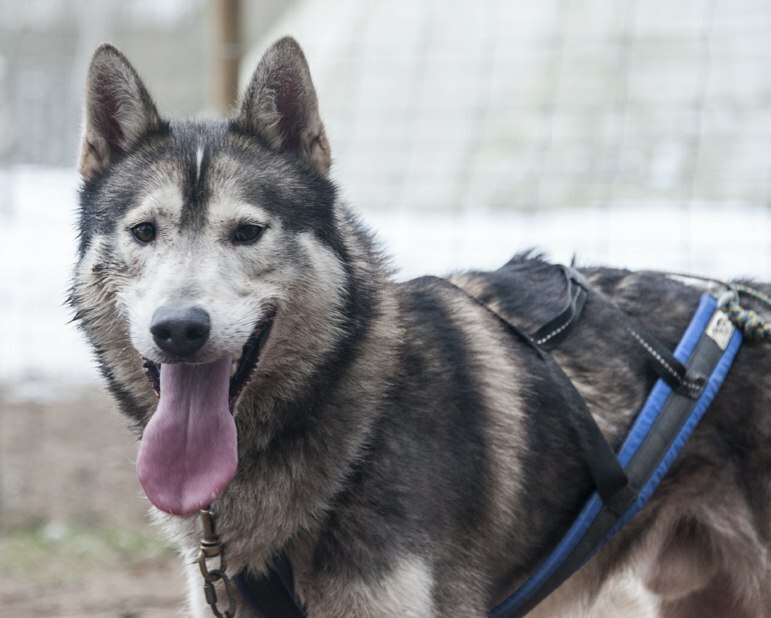 Race dogs are not a pure breed, with consequent inbreeding problems – they’re bred from both purebreds and mixes, to obtain strong and smart dogs, ideally suited to pulling sleds and living outdoors. 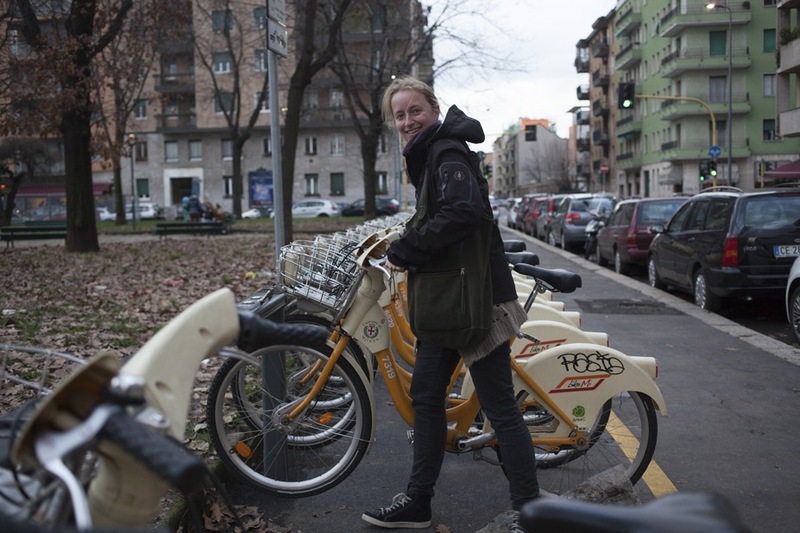 ‘But the tourists still prefer huskies!’ Jolanta told us. True – there’s nothing cuter than huskies! Naively, I thought dogs would be living free range. I asked Hubert why that wasn’t the case, and he explained that sometimes dogs don’t get on, and they are kept separate to avoid them hurting one another. However, dogs are kept fit by regular exercise, either pulling a sled, training or running around. Unfortunately, there wasn’t much snow when we visited, and so we weren’t able to have the experience on a traditional sledge, and had to use a wheeled cart instead. Hubert selected 6 dogs; the stronger ones were closer to the sled, while the faster dogs were first in line, further away from us. The dogs yelped in excitement as they were being led out and harnessed to the sled. We both harnessed a dog each; the one that was assigned to me was called Hattivatti and was a beautiful husky coming from Finland. Muddy face after running around! Afterwards, we were ready to go. There may not have been much snow and the day was not the best, but the experience was even better than our wildest expectations. The dogs travelled much faster than we had imagined, reaching up to 30 km/h. 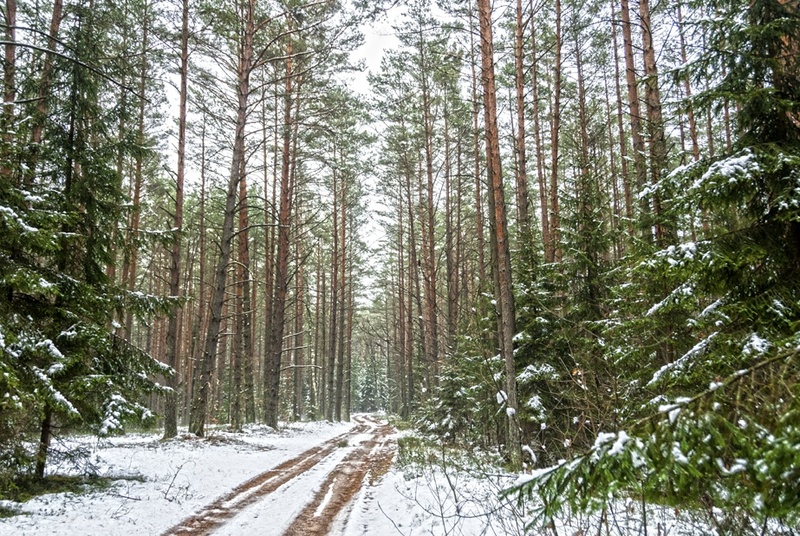 The sled felt as if it were flying, up a path and down another, across the forest, trees dusted with snow, then skirting the Neris River for a while, then up and down again. We were weightless, around us all was still and silent, save for the dog’s footsteps and Hubert’s commands. We travelled around the forest for about an hour, but we could’ve kept going forever. That same scenery that had left us underwhelmed at the beginning of the day, became magical, when seen from the back of a sled. It was like being in a winter fairytale, travelling across the frozen forest to a warm hearth and a cup of tea. Which is exactly what awaited us as soon as we returned – a log fire, a warm cuppa and some freshly-made blinis. Once we were back, the dogs looked happy and excited. They barked, jumped around, lapped at water from their huge tin bowls. I believe you can see happiness from their pictures here, and you could definitely feel their joy in the great outdoors, paws and muzzles in the snow. When we finished, the dogs looked like they were ready to start again – and so were we! Tell me that doesn’t look like a happy dog! Another happy fella… ready to go again! 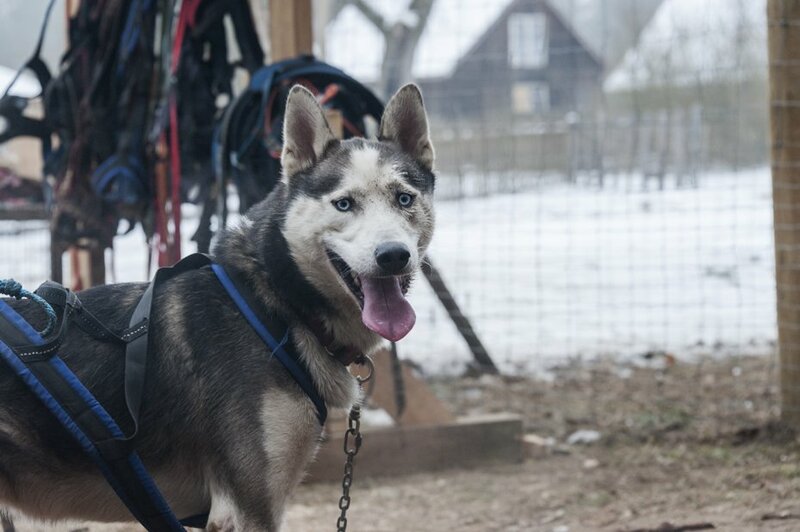 Dog sledding was a dream come true, but what was really special was being able to appreciate the love and care that Jolanta and Hubert have for their dogs. It was a wonderful, heartwarming experience. The proof that it is possible, as tourists, to interact with animals without harming them – and you’ll be left with priceless memories. We would like to thank Jolanta, Hubert, Linas and Nuotykių akademija for having invited us to join them for the day. As always, all opinions are our own. Beautiful dogs and a wonderful experience. We met some dog sled huskies and other breeds (also to our surprise) when we were in Alaska, but it was summer. Sounds like a fantastic experience for you and the animals. 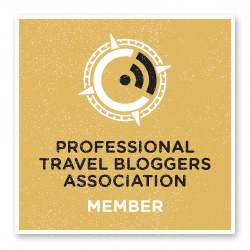 Happy to be part of the new Weekend Travel Inspiration with you and the others. Thank you Rhonda! It was one of the best days of my life… LOVED IT! This looks like so much fun and the dogs look beautiful. It’s great that you’re teaming up with Corinne for this linky, I’m excited to get to know the other hosts. It was fun, and so affordable! Great to meet you too Phoebe! Wow – what a great activity to take part in. The dogs look so impressive. Such expressive faces! Oh it was so much fun. Loved the day out with the dogs! Beautiful article and filled with wisdom. People tend to fall for extremes: they either take the most horrendous animal activities, like riding elephants, or visit tiger temples OR they avoid everything related to animal interaction because – in their good intentions – they think it’s wrong. Huskies were bred for this, it’s written on their DNA and not being able to fulfill their natural needs, can actually cause a lot of frustration. I personally get upset when I see people owning huskies as pets, who are locked in a small apartment, alone all day. That’s way more cruel that, a responsible dog sled activity. Thanks my dear sister, you couldn’t have said it better. I can’t stand seeing huskies living in hot places – it’s not what they’re made for. They were so happy between snow and ice (even though there wasn’t much snow)! This looks like wonderful fun. We have a Husky x Alsation but she has to be the laziest dog in the world and would never even dream about palling a sled! Thanks for stopping by Rosie! I’d love to see a pic of your dog. Love both breeds! Thanks for stopping by Paula! I’m loving your Japan and Bali adventures! What amazing dogs….it’s cool to read an article and bring this story closer besides the typical movie references that one can see. Thanks Francisco! It was such a cool experience… one of my best travel days ever! Margherita and Nick, What a great article. I agree 100% that research is the key to animal activities. 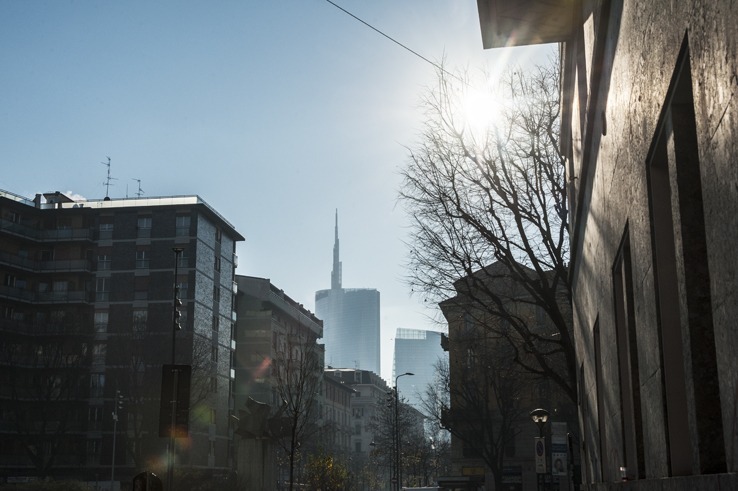 Thanks for co-hosting Weekend Travel Inspiration! I think it is very important for travellers to be informed. I love that you guys made a concious decision not to partake in activities that involve mistreating animals. That aside, I think huskies are adorable. I also think that you would enjoy listening to this podcast (it came to mind while reading your post) http://www.missedinhistory.com/podcasts/nome-serum-run/. 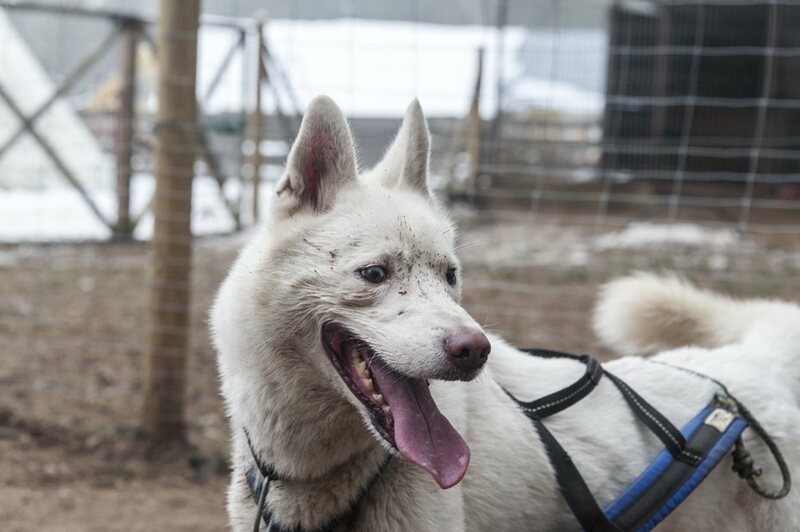 It is about how sled dogs helped to deliver much needed medicine to a remote community in Nome, Alaska. Thanks for the podcast Rachel. I’ll listen to it asap! I love huskies too, so I’m sure I’ll love it. Thanks for your comment! I’m surprised to find out that you can dog sled in Lithuania as I also assumed you had to get into the Arctic circle in order to do it. I’m so glad that you did your due diligence in confirming that this was a humane operation. From what you describe, they really do treat the dogs well, and the dogs seem to be enjoying themselves. What fun! Thanks for stopping by Michele! It was a wonderful experience, highly recommended for people of all ages! Hi Margherita, what a wonderful experience. It has been a dream of mine to go dogsledding. It’s good to know that one does not need to go to the Arctic Circle to do it. Moreso, it’s great to learn about those people who lovlingly care for their animals. It makes the experience even more special. I love the “happy dog” photos. Their happines really shone through the photos. Thanks Marisol! After braving Antarctica the cold won’t be a problem for you. I’m sure you’ll love dog sledding! This is fantastic!!! I had never even thought of dog-sledding before, not even on my radar. But after reading this post, I’m so excited to try it. And honestly, I love how much research you’ve done into animal abuse, and I really appreciate the resources and information. It’s something that I think a lot of people forget about sometimes, particularly while travelling, thinking that it’s only one-time-off thing in our own lifetime and forgetting that it’s one of thousands of people perpetuating the problem in the tourism industry. Thanks again <33 Happy travelling! Hey Elena! If you’re in Europe, it’s really cheap and easy to get to Lithuania! Thanks for your comment!